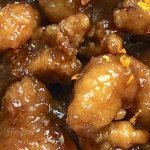 No need to head to Panda Express when you can make this Crispy Orange Chicken at home. Mix together egg, salt, pepper and vegetable oil in a medium bowl and set aside. In a separate medium sized bowl, add 1/2 cup corn starch and 1/4 cup flour and whisk together. Set aside. In a small bowl, dissolve 1 tablespoon cornstarch in 1/4 cup water. Set aside. Heat the oil in a deep-fryer or large frying pot to 375 degrees. Chop your boneless and skinless chicken into bite-sized chunks. Dip chicken pieces in the egg mixture, roll in the corn starch mixture until lightly coated, and place in your fryer for 3 to 4 minutes. When chicken turns a golden brown, remove from the fryer and place on a paper towel lined plate. Fry chicken in small batches to prevent lowering the oil temperature. Using a wok or large skillet add oil, ginger root, and garlic to a large wok or skillet and stir fry for about 1 minute, stirring constantly. Stir in chili peppers and green onions. Add rice wine and stir to combine for less than a minute. Add orange sauce to wok and bring mixture to a boil. Add fried chicken pieces and stir until coated in sauce. Stir in your small bowl of water/corn starch mixture and continue stirring until sauce thickens. Add sesame oil and stir until all ingredients are well incorporated and chicken is coated in a rich, thick orange sauce.